As we approach the 100th anniversary of the battle of Gallipoli and look at to the world today there is a clear link between New Zealand’s First World War contribution and the conception of an independent New Zealand that stands up for what it believes in. Although occurring almost a hundred years ago, remembering those who went off to fight and what they fought for is an important part of New Zealand’s history that has many lessons for future generations. Its content goes beyond the battlefields to look at how the events played out in New Zealand and how they continue to do so, with a few hidden little gems such as the recipe for ANZAC biscuits and the history behind why we wear poppies on ANZAC day. Tackling the topic of the First World War and ANZAC day with children in mind is not an easy task. 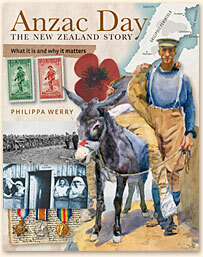 Philippa Werry has however managed to capture all sides of the story from the reasons for war, why so many young men in their prime went off to fight, and what ANZAC means for both New Zealand and Australians. This book does not glorify war nor does it create excuses. Its aim is to instil the lessons of the past and the need to remember those who went to fight in the name of New Zealand, ensuring that we do not forget their lessons. Priced at $25.00NZD this book is affordable and one that’s timeless stories will last with the ages, making it perfect for the classroom or a children’s library.